Online Ad Scanner is the PUP that uses misleading techniques to prevent removal. Use Reimage to locate malicious components and get rid of them faster than with uninstall instructions. A full system scan blocks virus reappearance and prevents traffic to malicious domains. Can I trust Online Ad Scanner? How to remove Online Ad Scanner virus from my computer? Online Ad Scanner is not what you have thought. If you installed this program thinking that it could help you find the best prices on the Internet, we will have to disappoint you. In reality, it is an adware which is used for collecting pay-per-click income. While seeking this aim, it keeps bothering its victims with sponsored ads and interrupts them during each of their browsing sessions. We must warn you that Online Ad Scanner virus may trick you into visiting questionable sites, so you must double-check each of its pop-up ads before clicking links that can be seen in them! Beware that its developers take no responsibility for these updates, so there is no doubt that you must avoid these pop-up ads and redirects. The easiest way to get rid of them is to remove this adware. This is especially recommended if it has infiltrated your machine behind your back. More information about distribution methods used by this PUP and Online Ad Scanner removal is provided below. If you need a quick solutions, use Reimage. In the beginning, people usually find “ads by Online Ad Scanner” useful and feel tempted to click them. However, after some time you may notice that something is wrong with them. The main thing that makes them so interesting is that this questionable program is capable of automatically collecting statistics about people’s browsing. Once it collects a needed amount of data, it transfers it to its developers who start using it for advertising aims. This PUP can also modify your PC system, alter your start page/default search engine and similar settings. Once it finishes this process, it starts generating tons of commercial advertisements on all of web browsers (Google Chrome, Mozilla Firefox, Internet Explorer, etc). In reality, these ads are displayed for causing redirects to sponsored websites. The problem is that users can never be sure what websites they may be redirected to. Surfing thru such websites may cause troubles and may trick you into downloading another adware or even malware on your computer. If you want to stay safe, make sure you remove Online Ad Scanner from your computer. Online Ad Scanner is a typical adware that may infiltrate your computer via various freeware and shareware. It may sneak into computer unnoticed and without an appropriate permission asked. Close examination of this adware has revealed that it is mostly distributed via download managers, video streaming software and PDF creators on various download websites, such as download.com, soft32.com, softonic.com and many other. Once installed, it starts working on every web browser, including Google Chrome, Internet Explorer and Mozilla Firefox, diminishes browser’s performance, displays irritating ads and pose threat to end up with virus infection. To avoid this situation, users should be more careful during installation of freeware. When trying to get rid of this adware manually, make sure you find each of its related components. For example, Online Ad Scanner, Window Route Manager, Network packet analyzer and others. Here, look for Online Ad Scanner or any other recently installed suspicious programs. To uninstall Online Ad Scanner from the system and prevent its infiltration in the future, make sure you eliminate these programs as well: Window Route Manager, Online Ad Scanner, Network Packet Analyzer, etc. Wait until you see Applications folder and look for Online Ad Scanner or any other suspicious programs on it. Now right click on every of such entries and select Move to Trash. When in the new window, check Delete personal settings and select Reset again to complete Online Ad Scanner removal. 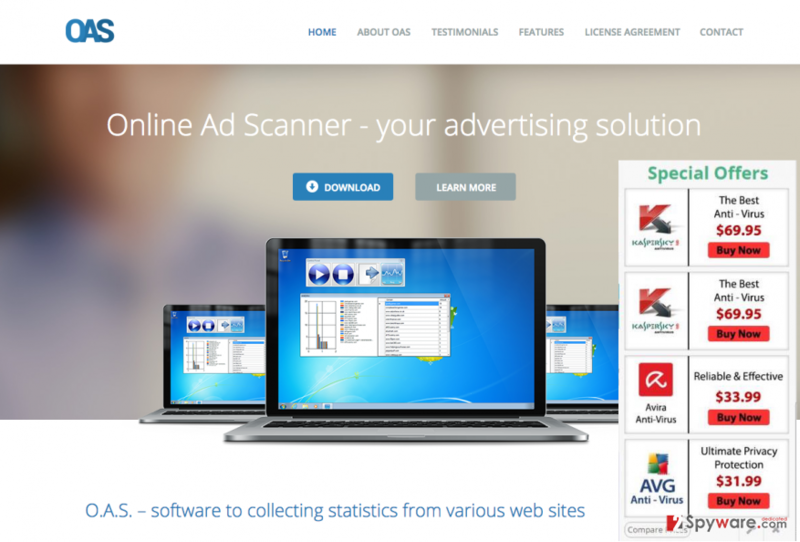 Here, select Online Ad Scanner and other questionable plugins. Click Remove to delete these entries. Now you will see Reset Firefox to its default state message with Reset Firefox button. Click this button for several times and complete Online Ad Scanner removal. Here, select Online Ad Scanner and other malicious plugins and select trash icon to delete these entries. Click Reset to confirm this action and complete Online Ad Scanner removal. Here, select Extensions and look for Online Ad Scanner or other suspicious entries. Click on the Uninstall button to get rid each of them. Now you will see a detailed dialog window filled with reset options. All of those options are usually checked, but you can specify which of them you want to reset. Click the Reset button to complete Online Ad Scanner removal process. This entry was posted on 2016-07-20 at 04:29 and is filed under Adware, Viruses. You can quickly scan the QR code with your mobile device and have Ads by Online Ad Scanner manual removal instructions right in your pocket. How did you remove Online Ad Scanner ads?